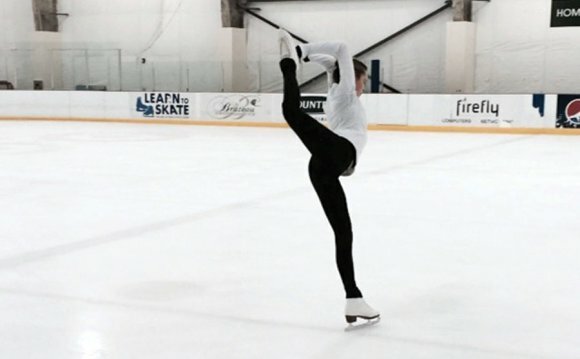 Eighteen Kelowna skaters traveled to Wenatchee, Washington to compete at the 2015 Apple Ice Classic figure skating competition over the weekend. The field of competitors included top skaters from the Seattle area, as well as skaters from as far as Alaska. The Kelowna Skating Club made a huge impression on their American counterparts, capturing medals in all events attended. A highlight for the local team was a podium sweep in the Intermediate Ladies Short event, as Alyssa Dobbs, Ashley Sales, and Daria Carr took gold, silver, and bronze, respectively. Dobbs, 12, went on to strike gold in the Free Program event as well, while Sales won another silver. At the Novice level, 12 year-old Olivia Gran won both the Short and Free segments, while club mate Madison Delcourt won silver and bronze medals. At the Senior level, Kelowna’s Julianne Delaurier struck gold in both the Short and Free divisions as well. Rachel Petttit did likewise in the Junior Ladies events. Meanwhile, 8 year-old Dar’ya Krylova made good on her first competition experience outside of BC, winning the Preliminary Ladies event in a field of 12 skaters. Malayna Lesko, Julia Crowther, Olivia Marleau, and Ajsha Gorman also accounted for medal wins in the total haul. Next up for the Kelowna Skating Club will be the Glacier Falls Summer Classic, a very challenging competition at Anaheim, California next month.